Three of the leading public health agencies in the Americas provide data and/ or map the Chikungunya epidemic sweeping across the Caribbean and the continental Americas. The Centres for Disease Control & Prevention (CDC) says that 'chikungunya case counts are publicly released every Wednesday', though these could not be found on its website, and provides a static presence/ absence map showing countries where local transmission has been documented. 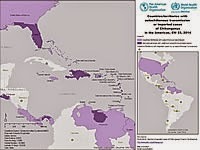 The Pan American Health Organisation (PAHO) provides a weekly report every Friday (usually late in the afternoon) of Chikungunya counts for most countries of the Americas (including the Caribbean) and a static presence/ absence map showing countries with both local and imported cases (travellers to the country). The PAHO map also highlights 'sub-national areas' with local transmission of the virus, e.g. the Divisions of Guarico, Carabobo, Aragua, Vargas and Miranda in Venezuela and the State of Florida in the USA. However it is not known whether the map is intended to communicate that these areas are Chikungunya hotspots within a country.